To say that fans are excited for Geoff Collins’ first season as head coach is an understatement. According to Tech’s athletic department, when football season tickets went on-sale for the 2019 season on Monday, Tech sold 81 percent more tickets on the first day of sales than they did in 2018, with 20 percent of season ticket sales accounted for by buyers who had not held season tickets in the previous season. But the same week that Tech fans enthusiastically threw money at Todd Stansbury, a quiet piece of news betraying the seemingly boundless optimism towards Collins’ approaching tenure as head coach emerged — All-ACC guard Parker Braun would be leaving the program as a graduate transfer. Braun’s departure was a subtle reminder of the dark side of regime changes, and not everything about bringing in a new coach represents positive change. Braun had been arguably both Tech’s best player and its most consistent for the past two seasons. Braun had started thirty-two consecutive games for Tech, achieving All-ACC honors in back-to-back seasons and served as Tech’s lone first-team All-ACC representative in 2018. 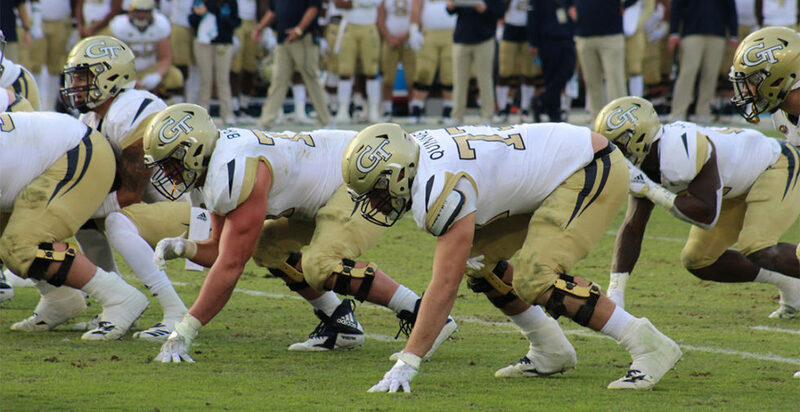 Braun was undoubtedly one of the finest offensive linemen to play at The Flats in the Paul Johnson era, but that distinction will not continue into the Collins era. Braun’s transfer serves as a sobering reminder of all that a regime change involves — including the negative. Braun is likely the first of many names to leave Tech; as Collins institutes a new staff, a new offensive scheme and likely a new defensive scheme, many players who were recruited to fit the mold of Johnson’s triple-option offense and former DC Nate Woody’s 3-4 defense have found themselves in flux. Many Johnson-era products with remaining eligibility very well may choose to take their talents elsewhere, either to other option schools or to places where there may be a better fit. In the coming months, Tech will — like many other programs who participated in this year’s coaching carousel — see a number of significant and even familiar names likely depart the program. Braun illustrates that kind of talent drain perfectly; as Tech’s most exemplary player from the past two seasons and a rising senior, he represents a significant loss for the program. Braun may have had any number of reasons for wishing to transfer, and as a graduate transfer he would have been able to do so without significant obstacles from the NCAA regardless of the circumstances, but Johnson’s departure undoubtedly played a significant role in choosing to take his talents elsewhere. As a fan, it can be disappointing to watch your favorite players, the building blocks of memorable seasons past, up and leave. But change — in football as in all things — is inevitable, and spectators are best served by embracing the change and looking to the future while reminiscing fondly on the past. Wish favorite players well as they announce their transfers, cheer them on in their future endeavours and remember well the glories of the past won — but know that such changes are for the best for all involved parties. Athlete departures give student athletes the ability to chase better opportunities elsewhere, while giving coaches the freedom to recruit fresh talent for the school. Still, it is difficult to say farewell to such talented players as Braun. But say farewell we must. Cheers to a dedicated and hardworking student athlete, who deserves nothing but success.